From Guillermo Del Toro's "Pan's Labyrinth" film, the Pale Man is a wan and emaciated thing; a nightmarish, child eating configuration shrouded in flaccid skin. It wheezes to life like an emphysematic sufferer when the young Ophelia decides to partake of a few bulbous grapes from it's buffet of tasty looking fruit. An artist by the name of Jake Anderson sculpted a life sized replica of the Pale Man that's equally as unsettling as the thing from Del Toro's film. Jake conveyed the nightmarish form of this character wonderfully. To say I was utterly delighted to paint this piece would be an oversimplification of the fact that I enjoyed every moment of it. Jake is a very talented artist with an affection for the macabre. To see more of his work, click Here. I feel like Art is a two way door; enter the door in one direction and see something that's wonderfully uplifting. Enter the door in the other direction, and experience an unmitigated urge to vomit. Either way, Art has it's affect on you in some form or fashion. More times than not, I choose to steep myself in the latter. Why? I truly cannot explain that. Any normal person would choose to commit ones self to lovely and wonderful things, right?! I don't know, that's very subjective, much like Art. Enter Artist Proof Studio: Fat Zombie. Sculpted by Norman Meyers. There are many zombie kits out there in the Garage Kit hobby; some very cool looking zombies. But when I think about it, is a reanimated corpse supposed to look cool...? Organic human remains come back to feast upon living tissues; or in this case a fat, rekindled creature, plump with an unwholesome brew which it spews abroad to infect any flourishing organism. Norman and I spoke at length of the world where the Fat Zombie is from. His imagination knows no bounds, and he provided me with much excellent insight and interesting ideas; such as the bristly hairs growing from the tumorous shoulder mass. It might be hard to make out a face from within the twisted mass of broken flesh on the Fat Zombie's back; it's fire blackened face split apart from the concussive effect of delivering the destructive potpourri. Amid the cranial chaos I decided to include a traumatized brain that I sculpted, sliding out and surrounded by bone fragments taken from a coyote skull. The crab claws emerging from the back side are not included with the Artist Proof release. I saw early work in progress photos of Norman's Fat Zombie vision with the crab legs, and I loved the way their hard sharpness just cut through the otherwise lumpy and swollen form of the zombie. I decided to add them myself. Fat Zombie rides triumphantly atop the head of a giant, rotten carcass of an unnameable creature. It erupts from underneath the surface of a sea of putrescence, not unlike a humpback whale of Earth's oceans. When I begin a project, I usually have a really good idea where I want to take it. But that's not to say I know exactly how I'll approach it. The trip always begins with a ride on the internet. With the Fat Zombie, it was my intention to keep a stern anchor in reference to real life tissue decay; but at the same time maintain small bit of freedom for interpretation. 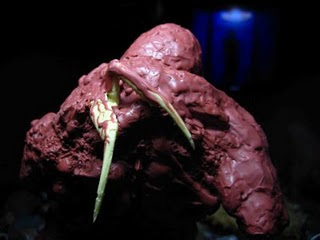 Norman sculpted the Fat Zombie and it's mount with many textures, boils, yawning wounds and sloughing skin. There's even an area of the mount where it's skin is peeling back to reveal the gleaming bone beneath. So I was faced with a challenge of trying to detail all aspects of the sculpture without making it look entirely too busy. I made the decision to work in strong, but subtle details to the base so I wouldn't detract too much attention from the rotund rider. Many of the elements I added to this piece I realized towards the end of the process. So in retrospect, I wish I had spent a bit more time browsing the plethora of possibilities that would potentially enhance the Fat Zombie before actually diving into it. So there's always learning to be done from each project.